Last week, a new high school opened its doors in Brooklyn, New York. Like many high schools in the country, the curriculum focuses on science and technology. But P-TECH is different than most of those schools. It will not only offer a high school education but will certify its graduates in a high-tech field. Students will also be able to obtain their associate degrees -- for free -- as part of their studies. And finally, graduates will have first crack at a job at IBM upon graduation. That's because "Big Blue" helped design the school -- a collaboration with it, the New York City Department of Education, and the City University of New York. IBM helped develop the curriculum; it chose the principal; it's committed funding and resources to equip the school with computers; and it's offering 130 IBM mentors -- one for each student at the school as well as for the principal. The principal is Rashid Davis, who leaves his position at the Bronx Engineering and Technology Academy to head the newly formed high school. 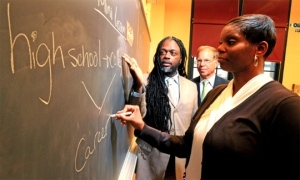 Although Davis was part of a grade-tampering investigation when he was the assistant principal at another school, his tenure at the Bronx Engineering and Technology Academy has been stellar, and the school has received much praise -- an A from the New York Department of Education and silver medal from the U.S. News & World Report. Last week, 130 freshmen started at P-TECH, and as the cadre moves through their high school and college careers, the school will add subsequent grades. IBM is working to match these students with mentors from all over the company; they'll communicate regularly and help support the students in the "workplace learning curriculum." Although it's aiming at a six-year program for the students, school officials says it will be flexible about the number of years they'll actually attend. Of the incoming class, more than 80% come from low-income families, according to a Wall Street Journal article. In a recent blog post, Davis makes an argument for importance of the type of education and type of opportunity that P-TECH will offer his students: "Young people from difficult circumstances must overcome the dual challenges of getting an education and navigating unfamiliar waters to move from poverty to meaningful, long-term employment. My job is to make that happen." But the tight relationship between a school and a major corporation raises a lot of questions. As The Wall Street Journal points out, "it's not the first time a business has partnered with the city to open a school. In the early 1990s, Goldman, Sachs & Co. joined with the city to open Metropolitan Corporate Academy. Initially, the company invested $500,000 for tutors, advisers and a program officer to coordinate internships. But as that support tapered off and test scores sagged, the school board voted earlier this year to close the school." At the outset, IBM's involvement in P-TECH is hands-on, in terms of shaping the school's curriculum, providing computer equipment, offering professional development and mentorship, and helping with job placement upon graduation. Indeed, the STEM-focused education promised by P-TECH is aimed at helping meet the growing needs for highly skilled, high-tech workers. And while the job prospects are good in STEM-related fields, it's too soon to tell whether P-TECH will provide the model by which more schools and companies will educate students and future workers.